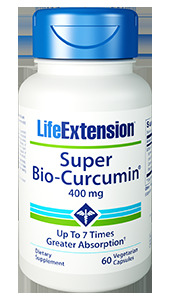 Life Extension Super Bio-Curcumin provides up to 7 times greater absorption. Curcumin was first used by Indians over 3000 years ago in traditional Ayurvedic medicine. Modern science has found that this extract from the common spice turmeric has remarkable qualities as an antioxidant. Over time, as our cells continue to be affected by free radicals, or oxidants, organs begin to degenerate and aging accelerates. The body has built-in defense mechanisms to protect itself from free radical damage, but eventually, aging depletes the body�s ability to keep oxidants at bay. New studies have tied inflammation to overexpression of a protein molecule called nuclear factor-kappa B (NF-kappaB). NF-kappaB acts like a switch to turn on genes that produce the body�s inflammatory responses. Because NF-kappaB�s expression increases in aging adults, scientists have sought ways to modulate NF-kappaB and its effects in the body. This Curcumin works fast with in 20 or 30 minutes most people fear relief from pain/inflamation without any side affects. Curcumin has been shown to exert powerful inhibitory effects on NF-kappaB activation within the body. Curcumin inhibits overexpression of NF-kappaB. Other clinical trials suggest roles for curcumin in helping maintain healthy lipid profile, bowel, and joint functions. Curcumin can also help maintain normal healthy platelet function. Curcumin may effectively rescue pancreatic islets from damage, the cause of deficient insulin production, without affecting the normal function of these cellular structures. Curcumin�s multifaceted effects include protecting against estrogen-mimicking chemicals, protecting against damaging free radicals, and promoting normal cell cycle growth. The 100% natural curcuminoids complex in Super Bio-Curcumin is a patent-pending synergistic blend of curcuminoids and sesquiterpenoids with enhanced bioavailability and sustained retention time in the body confirmed by human clinical studies. Super Bio-Curcumin is a �next generation� in delivery of curcumin compounds that no longer requires high doses of curcumin to reach sustainable levels of curcumin in the blood plasma. Each 400 mg capsule of Super Bio-Curcumin is equivalent to 2772 mg of a typical 95% curcumin extract. �Percent Daily Values are based on a 2,000 calorie diet. Your diet values may be higher or lower depending on your calorie needs.